Griffin has a relentless work ethic and from a physical stand point already looks to be college ready. 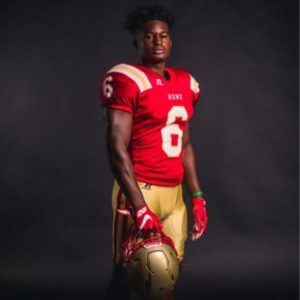 For his class we consider him to be elite running back – he has a fluid running motion, and can make cuts on a dime without losing hardly any speed. This season he is showing more power with his running, he is really playing behind his pads, and also implemented a powerful stiff arm to his game that has sent a handful of defenders into the turf. He is built like a brick house. Very efficient at running in between the tackles, and already shows a nice jump cut. Griffin is a threat in the passing game as well, and shows really soft hands, so much so, that he also takes punts for his Rome squad. The 2019 running back has all the ability to play at the Power 5 level and his offers are beginning to reflect that.